On February 21, hundreds of thousands of CrossFitters worldwide will tune in and gear up for 5 weeks of friendly competition. Think about that for a second. What other event brings so many people together to celebrate something so positive and meaningful as our health and fitness? If you’re on the fence and wondering whether the CrossFit Open is for you, let me make that easy for you. At CFK, we will have an Rx, Scaled and Beginner division, so whether you’re in your 10th year, or 10th day, sign-up and join us. Push yourself harder than you have all year, likely setting a PR or doing a movement you’ve never been able to before. I can’t recall a year where at least a handful of CFK’ers get their first pull-up, toes-to-bar, muscle-up, or set a weightlifting PR. Learn that you can go to places of discomfort that you weren’t sure of before (and that it will be o.k.) thus setting you up for a more successful year of training in 2019. Have an absolute blast tuning in and hanging out each week with all of your CFK buddies, cheering each other on, high fiving, chest bumping, and ringing PR bells. No matter your motivation, the Open offers something for everyone. If you enjoy competing with your friends, this is the mecca of fitness competitions! If you only want to compete with yourself, this is the perfect yearly benchmark. If this is your first year, go have a blast and set the bar for years to come. If you’re not into competing but you’re here for improved fitness and long-term health and wellness, then come have fun doing some tough WODs and learn something new about yourself in the process. The final Open WOD. The gym with the most athletes, per capita, to complete 18.1-18.4 will play host to 18.5 WOD and after party! Our annual 1-day inner-gym competition to crown the fittest in the gym! We’ll have Rx, Scaled, and Beginner, and Masters divisions. Sign-up for the CrossFit Open HERE. Q: I’m not sure if I should (or, am ready to) do the Open, should I? Q: What exactly is the “CFK Games”?? A: As stated above, our annual inter-gym competition! We get together on the 2nd Saturday following the Open, do a few workouts, cheer each other on, high five, and hand out some medals. 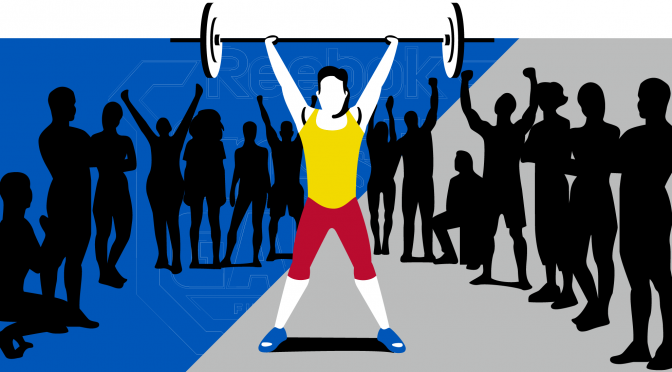 Anyone can participate whether you do the Open or not, however, your finishing position in the Open compared to the rest of your division counts as your first score at the CFK Games. This means that it usually weighs between 15-20% of your total CFK Games Score. Q: Which division should I compete in? A: You don’t need to designate it right this moment. See what the first workout is, view the scaling options, and then decide. Q: I really want to try the Rx workouts, but I’d like to compete in the scaled division at the CFK Games. Can I do that? A: Yes, but your CFK Games score might suffer. Your Open performance weighs intro your CFK Games scoring (about 1/5 of your total score), and we have to be able to compare athlete-to-athlete in each division. Therefore, you can either choose to do each Open workout twice (once as Rx and once as scaled for CFK Games scoring), or choose to only perform the Rx workouts, but you’ll begin the CFK Games at a slight deficit. Q: How do I register for a heat time on Saturdays? A: We will have a heat schedule posted in Wodify under the “CFK Games” program on Friday. Simply open the class schedule, filter to the “CFK Games” program, and reserve your spot in a heat! Q: What if I can’t make Saturdays for the Open throwdowns? A: We’ll do our very best to program the Open WODs on Mondays during CrossFit class. However, if logistics do not allow us to do so, you’ll need to perform the Open WODs during Open gym. Q: What is the deadline for submitting scores? A: For the CrossFit Open (online), you’ll need to submit prior to Monday at 8 p.m. EST. For the CFK Games, you’ll need to submit your score prior to the next Open WOD being released. Q: How do I submit my scores? A: For the online competition, submit at https://games.crossfit.com/. For the CFK Games, your score will be recorded if you complete the workout on Saturdays or Mondays during class. If performing on your own, submit scores via email (photo of scoresheet) to rick@crossfitknoxville.com. Q: Is there a beginner division? A: Yes, in the CFK Games. Not in the CrossFit Open online competition. We will have a beginner version of each Open workout posted in Wodify!